Have you ever wondered about the ‘Ranger’ name used by Ford? When was it used and what was it used on?? The first known Ford to carry the ‘Ranger’ name was a 1950 Ford Panel Delivery Truck that was converted to 4-Wheel Drive by the Marmon-Harrington company. Prior to truck manufacturers building their own 4-wheel drives in-house, trucks were converted to 4-wheel drive by companies such as Marmon-Harrington. These ‘Rangers’ were built from 1950-1952 and were based on the Ford F1 Panel Delivery with fewer than 50 built in 1950. ‘Ranger’ was the base series trim for the 1958-1960 Ford Edsel and were built on the shorter Edsel platform that was shared with the Ford Fairlane. In 1965, Ford reintroduced the ‘Ranger’ name as a styling package on F-Series trucks. 1981 would be the last year that Ford would use the Ranger name on it’s F-Series trucks. 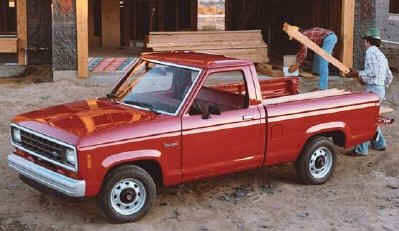 In 1983, Ford would introduce a compact pickup truck to replace the Mazda built Courier and call it ‘Ranger’. In 1967 Ford built a Ford Ranger II prototype. Look for the article on that HERE. Have other Ranger emblems to share? email them to admin@therangerstation.com.